You are currently browsing the Fat Cyclist weblog archives for January, 2014. A Note from Fatty: The Hammer applied to be one of the three Team World Bicycle Relief Ambassadors for 2014, and I’m indescribably happy to say that she won! More info as she sets up her donation page and we figure out how she (and we) are going to use this opportunity to talk about a cause we love. For now, though, I thought you might like to see her application. I would love to be an ambassador for WBR. After traveling with WBR on one of their Africa Ride tours I developed a great love for the people of Zambia. 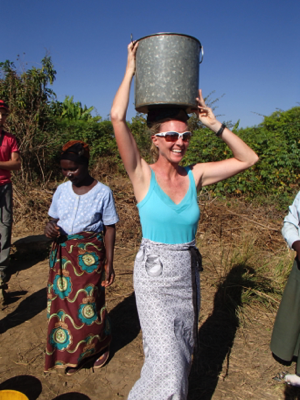 I saw, firsthand, how rural Zambians struggle daily just to live! I saw how few creature comforts they Zambian people have. They live in huts, they have no indoor plumbing or electricity, they grow their own food — and the majority have no form of transportation, save their own 2 legs. Despite these hardships, the Zambian people always seem to be smiling. There is a great sense of community and love among the people. I have seen firsthand how the addition of a bicycle can affect an entire community. As a nurse here in the United States, I can relate to the volunteer healthcare workers in the villages of rural Zambia. They are willing to sacrifice hours of their time helping others…but the majority of this time is usually spent walking from place to place. The addition of a bike can greatly affect their productivity. As an avid cyclist and lover of all things bike related, I would love to share the vision of WBR and what with other cyclists. What I’ve seen and who I am both make me love the mission of World Bicycle Relief. As a woman, I know and appreciate the value of having an education. It can empower a woman and offer them endless opportunities. As a mother of three girls, I understand how important an education can be to them in fulfilling all their dreams. I would love to see the dreams of thousands of Zambian women fulfilled by the addition of a bike in their lives. As a nurse, I know the benefits of one-on-one communication with my patients. I know the time constraints of travel and know that by moving fast I can see and care for more patients. I would love to see more caregivers with bicycles, so that more patients can be seen thus making their village a safer and healthier place to live. As a cyclist and athlete, I know the benefits of having a bike in my life. Biking and being outside make me happy and productive in all areas of my life. 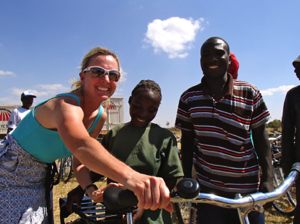 I would love to see more people in rural Zambia—and elsewhere!—develop a love for the bike. I like to say that the mountain bike helped me discover who I am and what I am capable of. About fifteen years ago, I was a mother of three young children and a wife in a failing marriage. I was being forced to leave my stay-at-home mom job and return to full-time work as a nurse. 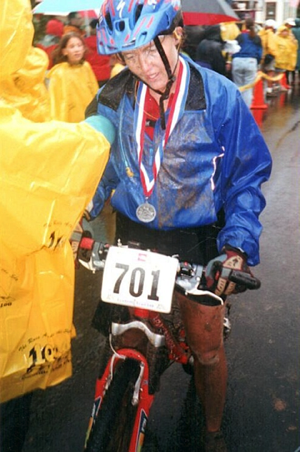 In the process of finding a job, I had also been training for a “little” mountain bike ride called the Leadville 100. I had never raced before in my life. My one attempt at a marathon ended in an injury two weeks before the event. Leadville would be my first attempt at racing-first attempt at pushing myself beyond my limits. I spent hours riding my mountain bike and hours fretting about my nutrition. And in many ways, the race itself was a disaster in ways I could never prepare for. Just forty-five minutes into the race, I felt a wobble in the rear of my bike. What was it? A flat tire! After an agonizing forty-five minutes changing the tire (believe it or not, I had never actually changed a tire by myself) I got back on the bike. I was literally the last person in the race. Every single rider had passed me; I was alone. For the next forty miles, I pedaled as fast as I could, and slowly started reeling cyclists in. By mile fifty, all seemed to be going well — I had made it to the halfway point, with six hours to go. Barring a catastrophe, I would finish this race within the twelve-hour allotted time. And then the first raindrops began to fall. The downpour began. For forty miles I rode through a torrential downpour and lightning storm. The temperatures at 10,000 feet (and higher!) were probably in the fifties. I was soaking wet, wearing shorts on and only a windbreaker for a jacket. By eighty miles, my fingers were so cold I could no longer shift. The dirt, mud and grit had destroyed my brake pads (this is before disc brakes). I stopped eating. My blood sugar levels were in the toilet and I was freezing. But I kept pedaling. I had started this race, and I was going to finish it. I would overcome the obstacles before me. No matter what. This race taught me that I can do anything I set my mind to. No matter what obstacles are thrown at me, I can work through them and succeed. This lesson has carried over into all aspects of my life. This twelve hours literally changed me. Joining forces with my husband (Elden “Fatty” Nelson of FatCyclist.com) and help him spread WBR’s message with the world through blog posts describing my races and encounters with other racers. By doing this, I’ll be able to help make WBR a focus of the blog throughout the year, instead of something he just talks about annually during his “Grand Slam” fundraiser. I intend to continue to fundraise for WBR with Elden/Fatcyclist.com, doing a WBR fundraiser on the site specific to my being an ambassador with WBR. During our busy racing season this summer, I would love to wear the WBR kit and spread the word at the races and events that we attend. A couple days ago, I was riding up the South side of Suncrest. I was near the top of this four-mile, 1200-foot climb, and it was getting cold and windy. This is not relevant to this story, but I like to point things like this out anyway. Because I like to paint pictures in your mind, and because I like to imagine that when you hear that I’m riding my bike up a mountain in the dead of Winter, you can’t help but admire me. Anyway, as I neared the top (for I had nearly completed this incredible climb), I saw a cyclist ahead of me. Normally this would tell me that the race is on, but this cyclist was walking. “You good?” I shouted ahead, as I neared him, intelligently using the absolute minimum number of syllables required to ask the cyclist whether he needed help. “My rear wheel won’t turn,” he replied. “Yeah, that would be great,” he replied, sounding a little embarrassed. So I — gratefully, I must admit, because it meant I got to take a break — climbed off my bike. “Hold my bike,” I said, then tried to spin his back wheel. Sure enough, it wouldn’t spin. And — very luckily for me — the reason why was obvious: the axle wasn’t properly seated in the dropout. Probably, he had taken a fall and it had got knocked loose then. “So, did you take a fall?” I asked. “Yeah,” he replied, even more embarrassed. “This will take just a second,” I said. “Nice work,” I said. “You’re about there.” I closed the quick release, said goodbye, and finished the climb. Then, the whole way down, I thought about how smart I am. Because — for probably the thousandth time in my cycling career — the “Hey, that’s a great bike” gambit had worked for me. We love our bikes. As cyclists, we can’t help it. They represent a choice, an expression of what matters to us. And — more often than not — of personal style. So it’s kind of nice to hear from someone else that they like our bikes. It’s a lot like hearing, in fact, that they like us…but less creepy, by a lot, than hearing, “I like you” from a complete stranger. But how you say it matters. Don’t just say, “Hey, nice bike” to someone. That can be misinterpreted as sarcasm, which may not be the best way to introduce yourself. And don’t say that to people who have super high-end bikes. They hear it often enough. Say it to anyone you come across on a bike. Say it to people who pass you. Say it instead of (or at least before) “on your left” when you’re passing people. I think it might have something to do with eating more — and worse — and exercising less, though I’m open to theories that let me blame someone or something other than myself. The thing is, I don’t want to tell you how fat I’ve gotten. I really don’t. So I’ve made a bargain with myself, which I think (hope!) will get me motivated to get close to the weight I need to be, before the 2014 riding season really begins. A forcing function, if you will. I have made an agreement that I have until March 1 to work on my weight in private, without telling you the astonishing number I have crept up to. On that day, I will tell you what my weight is. With discipline and luck and work and stuff, that number should be considerably lower than my current number. I have given myself, essentially, a grace period. I suspect that I am not the only one who is victim to the snowball effect post-race-season weight gain, combined with winter weight gain, combined with holiday weight gain. You might say that I suspect this strongly. So, how about we do this together. Between now and March 1, let’s work on dropping what we can, OK? And at that point, we’ll reveal where we are and how far we’ve still got to go. Also, at that point, I’ll be announcing a carrot / stick contest in conjunction with my friends at Beeminder, where we can work together, track each other, encourage each other, win stuff, lose stuff, and in general have some fun, combined with some serious accountability. Will you want to participate? This grace period where you’re working on your own should give you a clue. If you’re able to make great progress between now and March 1, maybe you’re fine on your own. If, on the other hand, you discombobulate between now and then, you probably ought to be prepared to sign up. So, fair warning. Your grace period starts now, too. To help me kick off my grace period redoubling of effort and weight loss, I’m joining the Tour of Sufferlandria, which starts tomorrow (Saturday, January 25). It’s nine days long, riding a Sufferfest video route each day. I’m expecting it to be a fantastic wake-up call. Plus, it benefits the Davis Phinney foundation for Parkinson’s, and I love me some good causes. And there are some nice prizes to win: bike tours, signed jerseys, coaching, and more. So, if it’s too cold to ride outside, maybe this is just what you need to get yourself motivated. And the awesome thing is, if you’re a Friend of Fatty (and you are), you get a 10% discount on buying the Sufferfest videos. Just use the code FATTY when you’re checking out. Even awesomer, every time that code is used, the King of Sufferlandria will donate $0.50 out of his own pocket to the Davis Phinney foundation, in the name of Team Fatty. So, you know, this is a pretty good time for you to round out your Sufferfest video collection and get back into shape. Are you in? Let me know in the comments. 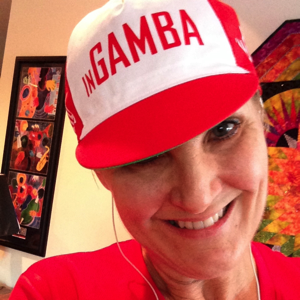 A Note from Fatty: I asked Nancy S to write a little bit about her experience with winning the InGamba Cycling Trip to Italy in the Grand Slam for Zambia fundraiser last month. Nancy is an amazing person; I am happy beyond words that she won this prize. And I think you’re gonna feel the same way. Fair warning: have a hanky handy. 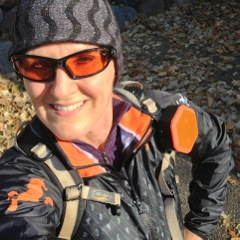 In the same vein as BostonCarlos’s recent guest post, I’m very excited to talk about the Awesomesauce (AKChick’s term, I believe) thing that has entered my life because of the most recent WBR campaign here on FatCyclist.com. I’m NancyJBS, formerly Nancy_in_MN. I changed my FatCyclist commenter handle for two reasons: because the old one was too hard to type and because I’d have to change it to Nancy_in_Italy for a week and then, sadly, switch it back to Nancy_in_MN. That’s right, I’m going to Italy courtesy of InGamba tours and WBR! I’ve known this for almost two weeks and I still get goose bumps when I write about it or talk about it… which I will do any time someone is foolish enough to ask. Being a fan and a Friend of Fatty wanna-be for the last 2 ½ years or so, I’ve come to feel awe for how Fatty brings great causes to our attention, how he attracts the most generous of prize donors and how he makes it fun to open my wallet. I had no idea how altruistic the bicycle industry was, on the whole, until I started seeing them in action in Fatty’s various campaigns. And I certainly didn’t think many of the pros were like that! The named prize donors in this campaign, Ibis, Boom, Trek, Specialized, Cannondale, SRAM and InGamba Tours knock my socks off with their commitment to making the world a better place through bicycles. Thank you! From the bottom of my heart, thank you! Then there’s that anonymous donor that matched every dollar donated in The Power of 5 campaign: Thank you, beautiful stranger! I like to think about this donor and how any one of us could be riding next to him or her and not even know it. It makes me want to look at every cyclist I meet in a different light and I LOVE that! Though I can’t reconstruct the whole thing, finding this site was densely connected with a very hard time in my life. In the weeks following my husband’s initial cancer diagnosis, I had a lot of lonely hours in the evening. Paul would be sleeping (he was SO sick from the nastiest of surgical complications) and I found myself web surfing for hours. After stumbling upon a local company, Twin Six, that sold a line of cycling apparel with the hilarious theme of Fat Cyclist, then thinking, “Hmmm, I’m kinda fat, maybe I should order a jersey”, then learning that the jerseys weren’t actually available, I clicked the link to Fatty’s site in exasperation. It started with how funny the blog was, and then the writing grabbed me. One night, digging through the archives for entertainment, I began to see hints of “the Susan story”, as I came to think of it, and a magical thing happened for me: I found someone who wrote about the pain and fears I was feeling from a perspective that I understood, one that wasn’t all about the horrors of cancer and the role of a caregiver. It was so much richer with the stuff about bicycling, the spoofs and the good causes. For a time I was obsessed with learning about Susan and Elden, as real people, doing the battle. It also mattered to me to know that Elden had come out the other end as a happy, quite possibly well adjusted guy that could enjoy life (and love!) like a normal person. I mined the archives for anything I could find. Alone at my computer, I would cry and rejoice for them and, even more, for Paul and myself. Essentially, it was the only time and place I would/could allow myself to wallow in self-pity about what was happening to us. I also felt freedom to think about what my future might look like without Paul. Late night grief therapy? Yeah, I think that’s what it was. And so much more! 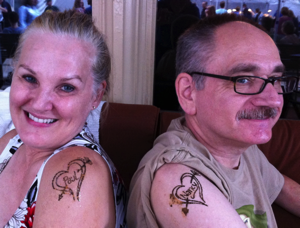 Fast forward 2½ years and we are done fighting Paul’s cancer. It’s been a beautiful and horrifying time filled with amazing people who walk into our lives at just the right time and tremendous, but patient, misery on Paul’s part. We are now in hospice care, gearing up for Paul to go to heaven and feel good at last. I say “we” because our hospice team really cares for the whole family. And then the best thing happened to me! Winning the InGamba trip is a dream come true. When fantasizing, like everyone else, about winning a prize in the contest, it was the InGamba trip that most grabbed my attention. Though the bikes were awesome, I didn’t need a new bike. I’m fortunate enough to already have a decent stable of bikes. But that trip! I didn’t even dare click the links to learn more about it because I KNEW it was an unattainable dream prize for me. I knew I couldn’t go on the trip because of the dates. It’s simply too soon, given what’s going on at home right now. So when Katie from WBR emailed me, I very nearly didn’t ask about the trip. After doing the happy dance for a bit (not pretty!) I called her, explaining my present situation, and the rest is history! Katie, sweet, kind, and competent Katie, immediately called Joao at InGamba (in Italy!) and he offered to let me take the trip when I’m able. The next day I got an email from Joao offering to send me a complete InGamba cycling kit so I could feel some of the InGamba love in the interim. See what I mean about bicycle people? Paul and I have had a terrific time imagining me riding in Italy on a beautiful Pinarello, learning to love the Chianti region, meeting Joao and the gang, and eating/drinking so well it’s almost indecent. Meanwhile, this win has gotten me out of a rut about cycling, it’s motivated me to fire up the pain cave and my Sufferfest videos and start thinking like a woman who intends to ride well in the near future. I am so blessed and very grateful! Mangi per vivere, vivere di corsa, corsa da mangiare! If the online translator I’m using did a good job, this means, “Eat to live, live to ride, ride to eat!” Now to learn how to pronounce it!